Homecoming festivities weren’t the only celebration Friday night at Boulder City High School as the Eagles football team provided plenty of fireworks in its 41-3 blowout victory over Western. Robert Vendettoli/Boulder City Review Boulder City High School senior running back Gino Carroll scored a touchdown and rushed for 55 yards off of eight carries during the Eagles' 41-3 victory over Western on Friday, Sept. 14, 2018. 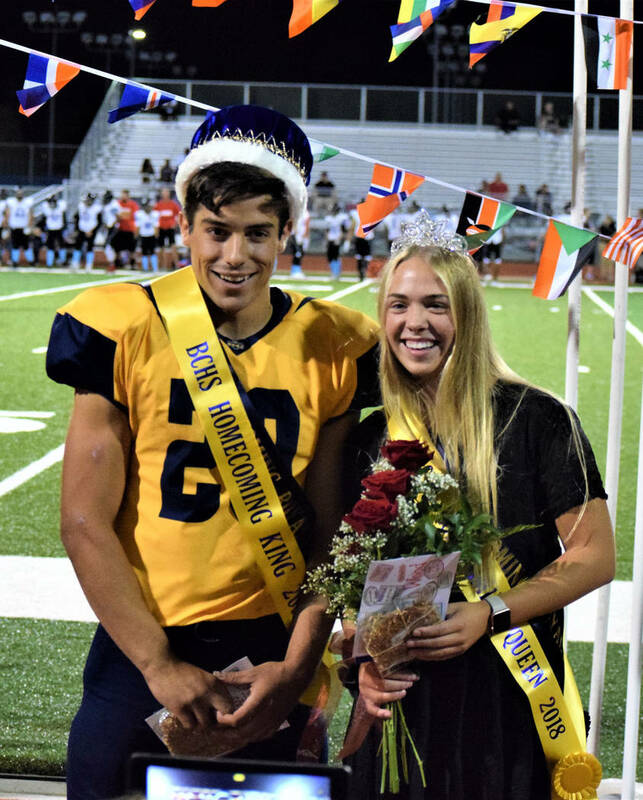 Robert Vendettoli/Boulder City Review Seniors Thorsten Balmer and Ashleigh Wood were named homecoming king and queen during festivities Friday during Boulder City High School's game against Western. It was the first time the Eagles have won their homecoming game since 2012. The Eagles gave a packed crowd plenty to cheer for, scoring four touchdowns in the first quarter to start the celebration early. Finding his way to the end zone on several occasions, senior running back Thorsten Balmer scored on runs of 10, 5 and 3 yards to start the game, followed by a 21-yard passing touchdown from junior quarterback Parker Reynolds to senior Jimmy Dunagan late in the first quarter. Carrying 16 times for a game-high 169 yards and four touchdowns, Balmer ended his night early after being named homecoming king. He scored the Eagles’ last touchdown on a 14-yard run on their first possession of the third quarter. Gaining 364 yards of total offense, senior running back Gino Carroll also scored a touchdown, plunging his way for a 3-yard score late in the second half. Carroll generated 55 rushing yards off eight carries, while sophomore backup quarterback Matt Felsenfeld finished the game for the Eagles with 50 yards on the ground off seven carries. Not needing to do a lot through the air because of their potent rushing attack, Reynolds finished 3-for-7 on the night passing for 70 yards, while sophomore receiver Trey Davis caught two passes for 49 yards. Fueling a defensive effort that only allowed 110 yards, Dunagan generated eight tackles and a sack. The Eagles face their biggest game of the season tonight, looking to make it four consecutive wins when they host rival Virgin Valley on Thursday Night Lights provided by myLVTV.